We have recently reported that lowering the pH to values that are frequently detected in tumors causes reversible anergy in both human and mouse CD8+ T lymphocytes in vitro. 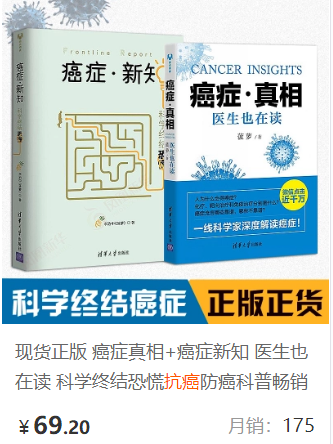 The same occurs in vivo, in the tumor microenvironment and the administration of proton pump inhibitors, which buffer tumor acidity, can revert T-cell anergy and increase the efficacy of immunotherapy. The tumor microenvironment is dynamic, as it evolves and adjusts its functions to cope with the compelling need of tumor cells to survive and grow. Thus, modifications of the cellular metabolism imposed by the altered microenvironment (often induced by oncogenic driver mutations), contribute to the shaping of the tumor milieu. little is known about how an acidic tumor microenvironment affects T-cell immunity. We have recently shown that lowering the pH to values most frequently detected within the tumor mass (pH 6�C6.5) causes the establishment of a state of anergy in both human and mouse tumor-specific CD8+ T lymphocytes in vitro. This condition is characterized by a significant impairment in cytolytic activity and cytokine secretion, coupled to a reduced expression of both the α-chain of the interleukin-2 receptor (IL-2Rα) and the T-cell receptor (TCR), as well as to a diminished activation of STAT5 and ERK in response to TCR signaling. We have also found that tumor-infiltrating lymphocytes (TILs) obtained from B16 melanomas, whose extracellular pH is approximately 6.5 (as specifically measured by in vivo magnetic resonance spectroscopy), display a similar anergic phenotype. Thus, tumor acidity negatively regulates tumor-specific effector T cells in both human and murine experimental settings (Fig. 1A), and might indeed contribute to the dysfunction of anti-tumor immunity. While it has been previously reported that hypoxia and/or the metabolic alterations of cancer cells may contribute to immune suppression, our results show that acidity per se represents a mechanism of immune escape. Further studies will help unraveling the mechanisms whereby acidity reduces T-cell fitness. Since perforin degranulation, cytokine release and proliferation are significantly impaired at pH 6.5, our hypothesis is that acidity alters the biochemical equilibrium that regulates physiological activities, including exocytosis, secretion and proliferation. Figure 1. Effects of proton pump inhibitors on tumor cells and tumor-infiltrating lymphocytes. (A) Alkaline intracellular pH in tumor cells is maintained by specific regulatory mechanisms, including those mediated by vacuolar H+-ATPases (V-ATPases). These pumps are devoted to extrude H+ ions into the extracellular space, decreasing pH values in the tumor microenvironment. According to our data, local acidity favors the onset of T-cell anergy in infiltrating CD8+ effector cells. (B) Proton pump inhibitors (PPIs) are lipophilic and weak base prodrugs that easily penetrate cell membranes and concentrate in acidic compartments, where they are very unstable and are transformed to biologically active inhibitors. Thus, in the presence of PPIs, tumor cells are no longer able to control intracellular pH and undergo apoptosis. PPIs also increase the extracellular pH, allowing CD8+ T cells to overcome anergy and recover a tumoricidal activity. Thus, PPI treatment increases the therapeutic efficacy of T-cell based immunotherapies. Interestingly, the anergic state observed in lymphocytes cultured at pH 6.5 is reversible upon pH buffering, although prolonged exposure to such an acidic environment or lower pH values cause permanent damage and T-cell apoptosis. Upon treatment of melanoma-bearing mice with a high dose of esomeprazole (12.5 mg/Kg), a proton pump inhibitor (PPI) employed to reduce gastric acid secretion,8 Olbe L, Carlsson E, Lindberg P. A proton-pump inhibitor expedition: the case histories of omeprazole and esomeprazole. we registered a rapid increase in the intratumoral pH, reaching values aroung 7.0 within 60 min and maintaining them for hours. In vivo pH buffering with PPIs was associated with improved TIL effector functions in melanoma lesions (Fig. 1B). Additionally, we detected a more efficient production of interferon γ (IFNγ) on a per cell basis. confirming our in vitro data and demonstrating that anergy as induced by low pH can be overcome by PPI treatment. PPIs are lipophilic and weak base prodrugs that easily penetrate cell membranes and concentrate in acidic compartments, where they are very unstable and are converted into sulfonamide forms, representing the active inhibitors. PPIs are rather tumor-selective immunomodulators, as they did not affect (at least in our hands) the T cells of organs lacking the acidic conditions required for prodrug activation, such as spleen, lungs and kidney. The selective effects of PPIs on tissues characterized by a low pH might also explain why these drugs can be administered at very high doses without significant toxicity, as it occurs in the treatment of patients affected by the Zollinger-Ellison syndrome. Most importantly, we have shown that the treatment of tumor-bearing mice with PPIs increases the therapeutic efficacy not only of adoptive-cell immunotherapy but also of anticancer vaccines. others have reported that pantoprazole (an esomeprazole analog) given to tumor-bearing mice results in enhanced tumoricidal activity by macrophages.10 Vishvakarma NK, Singh SM. Immunopotentiating effect of proton pump inhibitor pantoprazole in a lymphoma-bearing murine host: Implication in antitumor activation of tumor-associated macrophages. 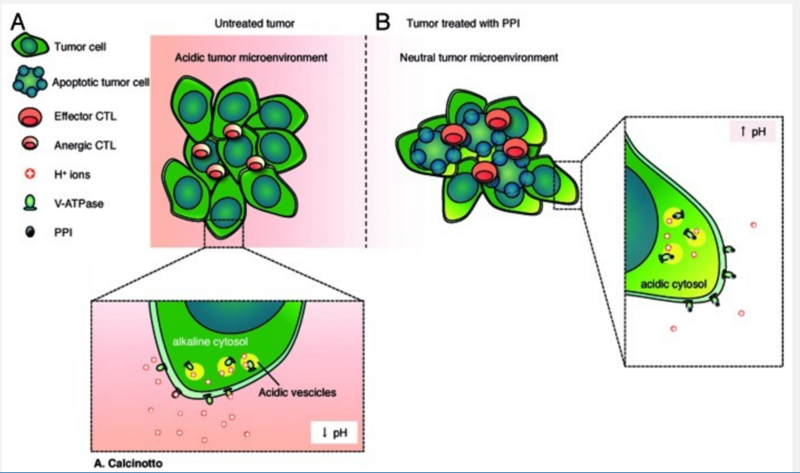 Altogether, our findings show that the acidification of the tumor microenvironment is a novel mechanism of immune escape that can be overcome by drugs targeting pH-regulatory pathways, like PPIs, which can increase the clinical potential of T cell-based cancer immunotherapy.